With strawberry season in full swing, it’s time to make these portable little strawberry hand pies. Eat them on the go or enjoy them with a scoop of ice cream! Strawberries have taken oven my kitchen. I have a ton of new strawberry recipes coming soon: balsamic strawberry shortcakes, strawberry icebox pie, and strawberry matcha layer cake. But, first up are these cute mini strawberry hand pies! What makes these hand pies special? 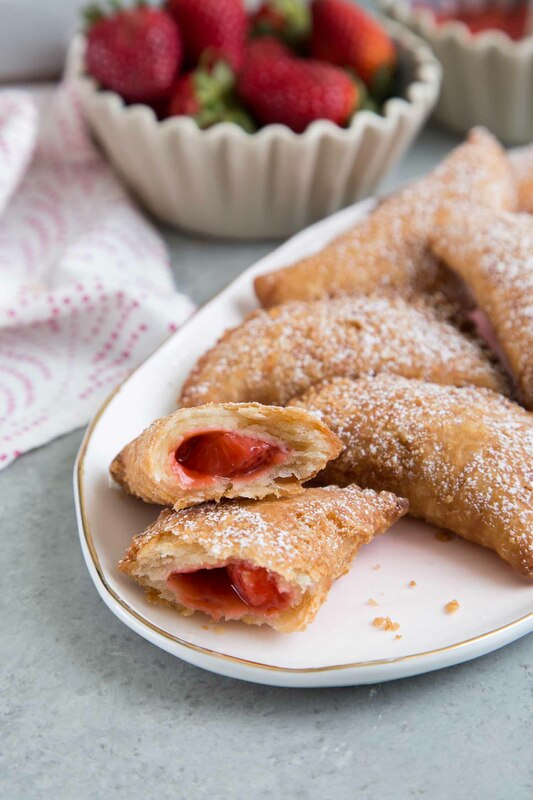 Strawberry hand pies are similar to the traditional strawberry pie, except these hand pies are fried! Frying the pie dough lends to a more crispy crust. The hand pies are evenly cooked. Whereas, sometimes, baked pies have soggy or partially cooked bottoms. These strawberry pies are small and bite-sized making them perfect for dessert buffet spreads or just a bite of something sweet. Roll out chilled pie dough and cut out rounds using a 4 1/2-inch cookie cutter. Add one tablespoon of strawberry filling to each pie dough. Fold over the round to create a semi-circle. Pinch the seams together to seal the filling instead. Use the tines of a fork to ensure the seams of the pie dough are secure. Place assembled hand pies on a parchment lined sheet tray. 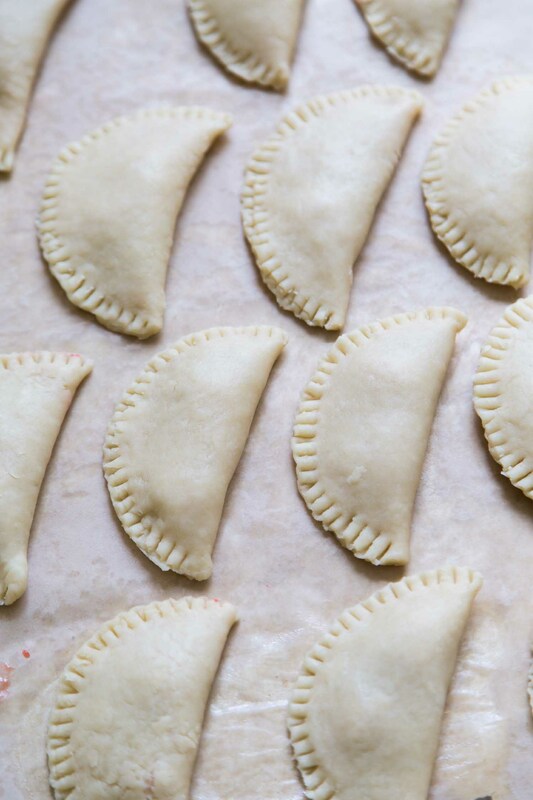 Chill hand pies in the fridge while you heat up frying oil. Why is there vinegar in the pie dough recipe? The small amount of apple cider vinegar prevents gluten development in the pie dough. Gluten forms when water and flour are mixed together. Gluten gives dough strength and elasticity (meaning it shrinks back when stretched). By inhibiting gluten development, this pie dough is easily to roll out. You will smell the vinegar while working with the pie dough. However, you will not taste it after cooking. 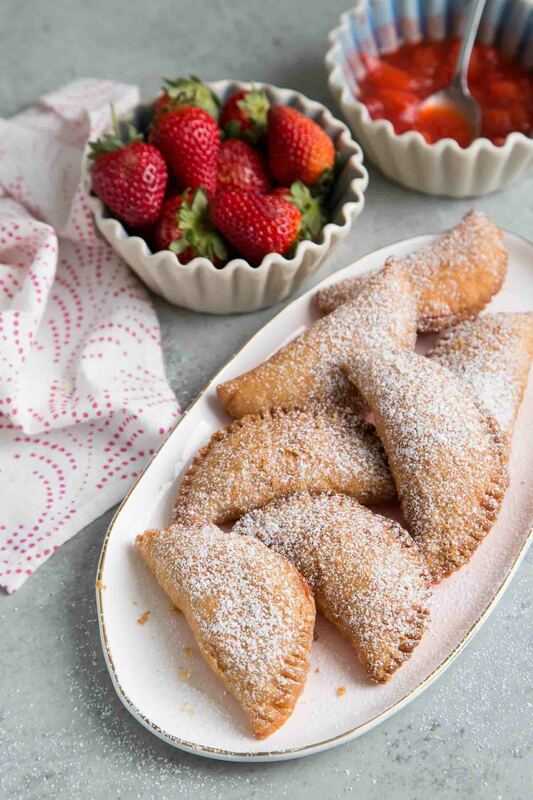 These strawberry hand pies can be enjoyed fresh from the fryer or served at room temperature. 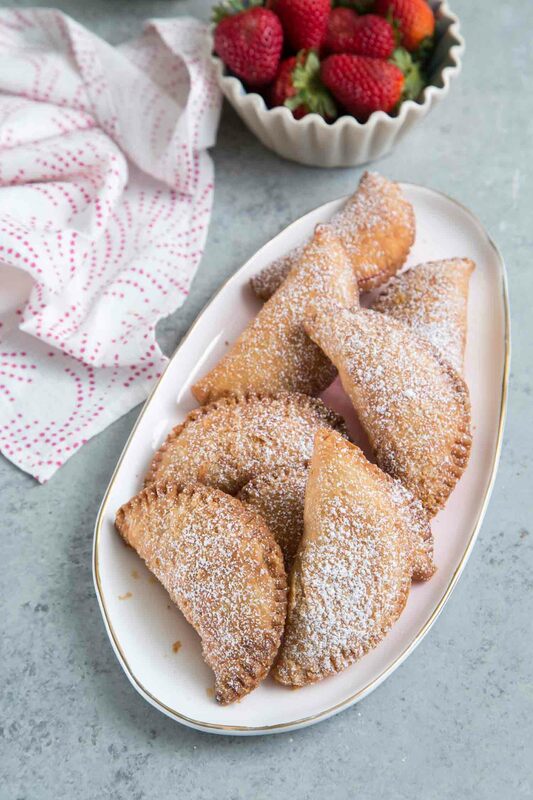 Dust hand pies with sifted powdered sugar before serving. 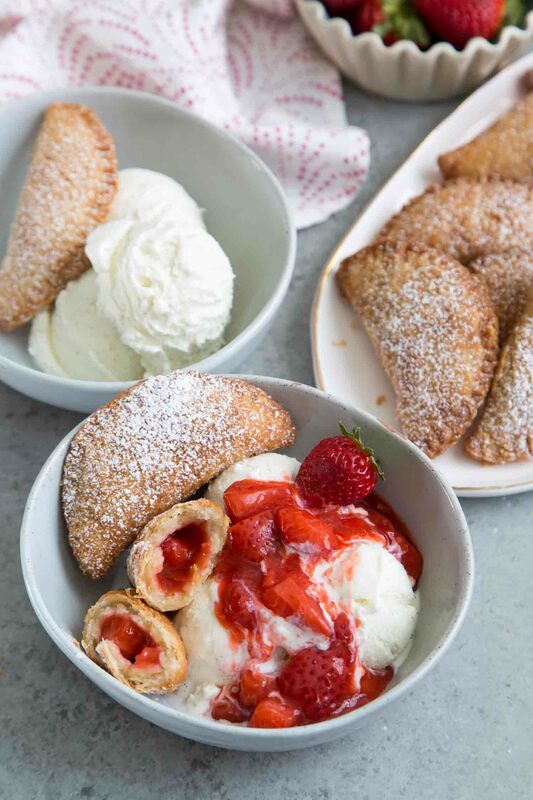 For a sweet treat, serve the warm strawberry hand pies with a scoop or two of vanilla ice cream. Nothing beats the delicious contrast of warm pie with cold ice cream! In a large bowl, combine flour, salt, and sugar. Add cubed butter and shortening. Cover and let chill in the freezer for about 5-8 minutes until ingredient are cold. Using a pastry blender (or two forks), cut cold butter and shortening into flour mixture until it resembles coarse, pebbled sand. Add vinegar and ice water. Fold to combine until dough is a shaggy mess. Dump dough onto a lightly floured work surface and knead until mixture comes together. Pat dough to a thickness of about 1/2-inch. Wrap in plastic wrap and let chill in the fridge for at least 2 hours (overnight is best). In a small sauce pot, combine strawberries, sugar, and cornstarch. Set over medium heat and bring to a boi. Stir often to prevent mixture from burning along the sides. Boil for 10-15 seconds to cook out cornstarch flavor. Remove from heat. Stir in lemon juice and salt. Remove from heat and allow to cool. Transfer to an airtight container and keep chilled in the fridge until ready to use. Allow dough to rest at room temperature for 5 minutes. Roll dough out 1/4-inch thick on a lightly floured surface. Cut out as many 4 1/2-inch rounds. Gather, knead, and re-roll the dough to cut out additional rounds. Place one tablespoon of chilled filling in the center of each dough round. Fold dough over to make a semi-circle (half-moon shape). Secure the edges with the tines of a fork. 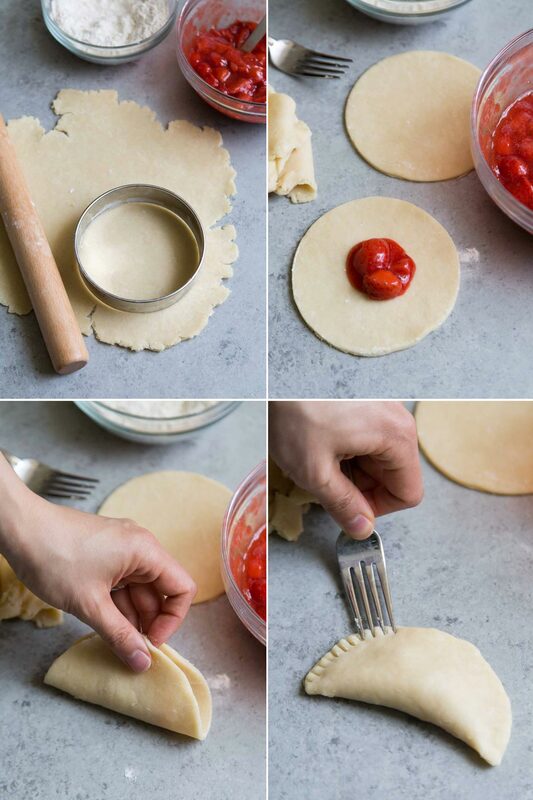 Place assembled hand pies on a parchment lined baking sheet. Chill in the fridge for 30 minutes while frying oil heats up. Fill a large pot (dutch oven or heavy bottomed pot works best) with 3-inches of vegetable oil or vegetable shortening. Use a candy thermometer to measure the temperature. Heat oil to 365 degrees F.
Carefully place 3-4 hand pies at a time into hot oil. Do not overcrowd the pot. Cook for 2-3 minutes on each side, until golden in color. Drain fried hand pies on wire rack or paper towel lined baking sheet. Keep an eye on candy thermometer and adjust heat according to maintain a constant cooking temperature. Strawberry hand pies can be served warm or at room temperature. 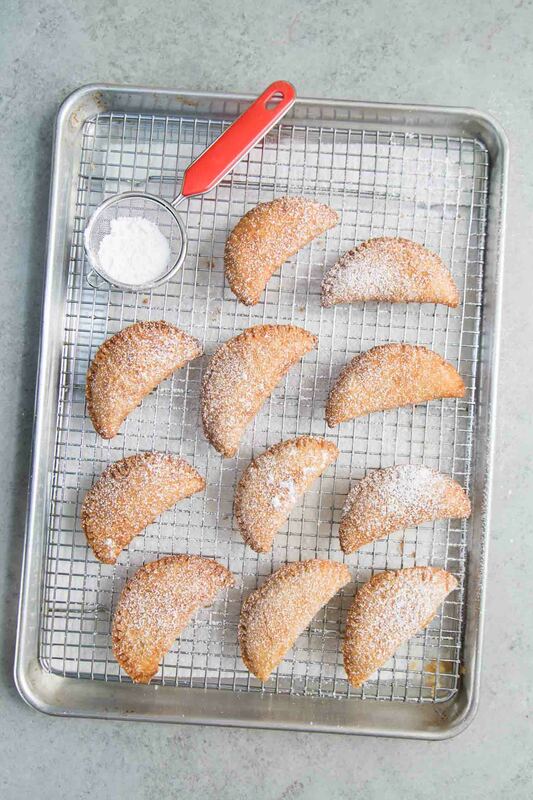 Dust hand pies with sifted powdered sugar before serving. I use this organic vegetable shortening. These hand pies are better served the same day as frying. Frying in shortening results in a crispier exterior. The hand pie will feel less greasy than oil-fried. Use a candy thermometer to maintain proper cooking temperature. There will be leftover strawberry filling. Use as dipping sauce or spoon over ice cream. Keeps covered in the fridge for up to 4 days.